The 2010 Turkish Grand Prix (formally the 2010 Formula 1 Turkish Grand Prix) was a Formula One motor race held on 30 May 2010 at the Istanbul Park circuit near Istanbul, Turkey. It was the seventh round of the 2010 Formula One season and the sixth Turkish Grand Prix. The 58-lap race was won by McLaren driver Lewis Hamilton who started from second position. His teammate Jenson Button finished second, and Red Bull driver Mark Webber came in third. Webber clinched the pole position and maintained his lead at the start of the race with Hamilton in second who fended off a challenge from Sebastian Vettel in the other Red Bull. The order was maintained until the first round of pit stops when Hamilton lost second place after his crew had trouble with fitting one of his tyres correctly. Webber conserved fuel on lap 40 which allowed Vettel to challenge him for the lead but the two collided which led to the latter retiring from the event and the incident promoted Hamilton and Button into the first and second positions. Hamilton and Button were instructed to conserve fuel for the remainder of the race but the latter had not been giving a target lap time and attempted to overtake Hamilton on lap 48 although the former retained the lead which he held for the remaining ten laps to win his first race of the season. Hamilton's victory made him the fifth different driver in seven races to win a Grand Prix in 2010. The result meant Webber's advantage over second place in the Drivers' Championship, now occupied by Button, was extended by five points. Hamilton's victory meant he moved into third place, while Alonso went from third to fourth. Vettel's retirement resulted in him dropping from second to fifth. McLaren's 1–2 finish resulted in them reducing Red Bull's lead in the Constructors' Championship to one point. Ferrari's poor result meant they moved from second to third, with 12 races left of the season. Istanbul Park, where the race was held. The 2010 Turkish Grand Prix was the seventh scheduled round of the 2010 Formula One season after taking a two-week break from the previous race of the season in Monaco. It was held on 30 May 2010 at the Istanbul Park circuit in Istanbul, Turkey. The Grand Prix was contested by twelve teams with two drivers each. The teams (also known as constructors) were Red Bull, Mercedes, McLaren, Ferrari, Renault, Williams, Force India, Sauber, Toro Rosso, Lotus, Hispania and Virgin. Tyre supplier Bridgestone brought four different tyre types to the race: two dry compounds (soft "options" and hard "primes") and two wet-weather compounds (intermediate and full wet). Before the race Red Bull drivers Mark Webber and Sebastian Vettel were tied for the lead of the Drivers' Championship with 78 points each, with Ferrari driver Fernando Alonso in third with 75 points. Jenson Button was fourth on 70 points and Felipe Massa was fifth on 61 points. In the Constructors' Champions Red Bull were leading with 156 points, Ferrari and McLaren were second and third with 136 and 129 points respectively, while Mercedes (78 points) and Renault (65) contended for fourth place. Ferrari, McLaren and Red Bull had so far clinched the six previous victories of the season. Championship competitors Massa and Robert Kubica had both secured second place podium finishes with Lewis Hamilton and Nico Rosberg having both achieved third place podium finishes. Webber dominated the previous two rounds in Spain and Monaco and clinched the pole position in both events. Despite the form, Webber said Red Bull were still wary of their rivals, saying that they had a good foundation and position but no person knew who would be challenging for the title late in the season, but did not feel it would between two people. Ferrari came into the event with a long series of success at the track, having won three of the last five races held at Istanbul Park. The team identified the event as their 800th Grand Prix and their cars carried a logo celebrating the achievement on their engine covers. Alonso was upbeat about their chances in the race, saying that compared to the Spanish Grand Prix, he felt their situation was a little better due to the fact Istanbul Park's characteristics are different and did not require the maximum amount of aerodynamic downforce, but a lower level which was suited to the F10. Alonso also believed it would be a "surprise" if the Red Bull team finished behind him. Hamilton claimed that McLaren would be competitive in Istanbul and hoped that he would secure his first victory of the season. Several teams made modifications to their cars in preparation for the event. Red Bull introduced a revised version of its RB6 chassis for Vettel as his previous monocoque had a small defect which created handling difficulties in Monaco. The team tested a version of McLaren's F-duct system (which increases the top speed of a car) during the Friday practice sessions but removed it for qualifying and the race because both of McLaren's drivers found the device difficult to operate. Ferrari modified their F-duct system so that it would allow their drivers to operate the system by using their left leg. Mercedes arrived at the circuit by reverting to a previous specification of suspension and introduced a longer wheelbase on both their cars as well as a new version of their F-duct system. Williams decided to revert to an old specification of their front wing following accidents involving their drivers in Monaco, though the team brought new brake ducts. Lotus débuted a new rear wing specification which improved forward balance of their chassis. Virgin managed to procure a longer-wheelbase version of the VR-01 for Lucas di Grassi after the 2010 eruptions of Eyjafjallajökull prevented them from having two cars prepared in time for the previous race. Three practice sessions were held before the Sunday race—two on Friday, and a third on Saturday. The Friday morning and afternoon sessions each lasted 90 minutes. The third session was held on Saturday morning and lasted an hour. The Friday morning practice session was held on a dusty track scattered with debris and several drivers spun off the track. Hamilton set the fastest time of the first session, at 1 minute and 28.653 seconds; his late lap was almost one second quicker than teammate Button. The two Mercedes drivers ended third and fourth quickest; Michael Schumacher ahead of Rosberg. Vettel and Webber set the fifth and eighth fastest times respectively for Red Bull; they were separated by the Renault cars of Kubica and Vitaly Petrov. Alonso and Adrian Sutil rounded out the session's top ten drivers. The session was disrupted with two minutes remaining when Sutil ran wide at turn eight, which caused him to spin backwards and crash into the barriers, breaking his front wing and both front tyres. The session was prematurely ended due to the limited time running. In the second practice session, Button set the quickest lap of the day, a 1:28.280, which was nearly one tenth of a second quicker than Webber. Vettel was third fastest followed by Hamilton in fourth. Alonso was fifth. Both Mercedes cars were slower in the session with Rosberg sixth and Schumacher seventh. Kubica, Petrov and Massa followed in the top ten. Webber stopped outside the exit of turn two with an engine failure and engaged in an argument with marshals on preventing the car from moving backwards. In the final practice session, Vettel was fastest with a time of 1:27.086. This made him three tenths of a second faster than Rosberg in second place. Hamilton set the third quickest lap despite spinning sideways into the turn eight gravel trap. He was ahead of Webber who was afflicted with a throttle problem, Kubica and Alonso. Schumacher, Button, Massa and Petrov completed the top ten ahead of qualifying. Mark Webber (pictured in 2014) had his third consecutive pole position of the season. The qualifying session held on Saturday afternoon was split into three parts. The first part ran for 20 minutes and eliminated the cars from qualifying that finished the session 18th or lower. The second part of qualifying lasted 15 minutes and eliminated cars that finished in positions eleven to 17. The final part of qualifying determined the positions from first to tenth, and decided pole position. Cars which competed in the final session of qualifying were not allowed to change tyres before the race, and as such started the race on the tyres that they set their quickest lap on. The session was held in dry weather conditions. Webber set the fastest time in the final part of the session, which clinched him his third successive pole position with a lap of 1:26.295. He was joined on the front row of the grid by Hamilton, who recorded a lap time 0.148 seconds slower. Vettel set the fastest times in the first two qualifying sessions, but made mistakes on his first two runs due to a roll-bar failure in the final session which prevented him from recording a faster lap. He dropped to third overall in the final part of qualifying. Button made an error in his car set-up which caused him to run too low to the ground through turn eight which restricted him to fourth place. Schumacher qualified in fifth and was happy with his starting position despite spinning at turn eight on his final qualifying lap. Rosberg qualified sixth and despite wanting to start higher up the field, he was confident about his race chances. Kubica had problems when running the soft compound tyre managing seventh but was happy with his lap in the final part of qualifying. He was ahead of Massa in the faster of the two Ferrari cars. Petrov secured ninth in the slower Renault car. Kobayashi rounded out the top ten fastest qualifiers. Sutil was the fastest driver not to advance into the final session in eleventh; his best time of 1:27.525 was eight tenths of a second slower than Vettel's pace in the second session. Alonso recorded the twelfth fastest time and could not secure a position in the final session as his car touched a white line under braking on the circuit, causing his car to slide. Nevertheless, Alonso thought that the error did not cost him time. He was followed by Pedro de la Rosa in the other Sauber car in 13th, who in turn, was ahead of Sébastien Buemi for Toro Rosso and Williams driver Rubens Barrichello. This formation continued on the eighth row of the grid, which was occupied by Jaime Alguersuari in the second Toro Rosso and Nico Hülkenberg in the other Williams. Vitantonio Liuzzi failed to move beyond the first session; the Force India driver qualified in 18th. The Lotus cars of Heikki Kovalainen and Jarno Trulli lined up in 19th and 20th respectively. Timo Glock and Bruno Senna lined up on the eleventh row of the grid, with their teammates Lucas di Grassi and Karun Chandhok qualifying at the rear of the field. The race started at 15:00 Eastern European Summer Time (UTC+3). The conditions on the grid were warm and sunny before the race; there was an air temperature between 28 to 29 °C (82 to 84 °F) with an track temperature ranging between 39 to 49 °C (102 to 120 °F). Di Grassi changed his engine and started the race from the pit lane because his team rectified an issue with his engine oil system which was discovered one hour before the start of the race. As the five red lights went out to signal the start of the race, Webber maintained his pole position advantage heading into the first corner. Hamilton had wheelspin when he moved out of his starting position and abandoned the use of his second clutch. Vettel made a good start and passed Hamilton for second around the inside of turn one but Hamilton reclaimed the position by passing Vettel around the outside at the third corner. Schumacher also made a good start and got ahead of Button for fourth place but the latter retook the position at turn twelve after slipstreaming in Schumacher's tow on the back straight. De la Rosa ran wide at turn two allowing Buemi to pass him heading into the third turn. However, Buemi went wide allowing Hülkenberg to take advantage of Buemi's error. Buemi attempted to re-pass Hülkenberg around the inside at turn seven but Hülkenberg made contact with Buemi, puncturing the right rear tyre of Buemi's car which forced both drivers to make early pit stops. At the end of the first lap, Webber led Hamilton by 0.4 seconds, who in turn was followed by Vettel, Button, Schumacher, Rosberg, Kubica, Massa, Petrov, Sutil, Kobayashi, Alonso, de la Rosa, Alguersuari, Hülkenberg, Liuzzi, Trulli, Kovalainen, Senna, Barrichello, Glock, Chandhok, di Grassi and Buemi. Sebastian Vettel collided with teammate Webber on the race's 40th lap. The first four drivers opened a gap from the rest of the field, as Webber set the fastest lap of the race so far on lap two with a time of 1:33.685. Hamilton attempted an overtake manoeuvre on Webber heading into turn twelve on lap three but was unable to get close to affect a pass. Alonso passed de la Rosa for twelfth place on the same lap and began to battle Kobayaski for eleventh. Hamilton attempted to pass Webber for a second time at turn twelve on lap four but could not get close enough. This was because Hamilton's car was more effective than Webber's; it allowed Webber to pull away through turn eight but Hamilton could close the gap between himself and Webber in the back straight by employing his car's F-duct. Hülkenberg passed di Grassi and Chandhok in turn eight to move up into 21st place by lap six, while Webber, Hamilton and Vettel traded the fastest lap with Hamilton quickest on the same lap. McLaren became aware of a higher than expected fuel consumption by the tenth lap and they ordered both their drivers to change engine modes in an effort to conserve fuel. Kobayashi made a pit stop on lap eleven which released Alonso into clean air; Alonso made his pit stop on the following lap for hard tyres and rejoined ahead of Kobayashi. The next few laps saw a large amount of activity in the pit lane. Vettel made his pit stop from third position on lap 15, and rejoined in front of Rosberg, while Button pushed hard in an attempt to move ahead of Vettel. Hamilton and Webber both made their pit stops on the following lap; Webber emerged in front as Hamilton's pit crew were slow to fit Hamilton's left-rear tyre. Hamilton fell to third place behind Vettel. Button thus inherited the lead but reported to his team via radio that he was losing rear grip in his tyres after pushing hard. He made a pit stop on lap 18 and re-emerged in fourth. Hamilton attempted to pass Vettel around the outside heading into turn 12 on lap 18 but was unable to complete the manoveure after running deep into the corner. By the end of the 19th lap, all of the leading drivers had taken their pit stops. The running order was Webber leading with Vettel, Hamilton and Button in close attendance, then a 15-second gap back to Schumacher, Rosberg and Kubica. Massa in eighth was being caught by Petrov in ninth, and the two were followed by Alonso, Kobayashi, Sutil, de la Rosa, Alguersuari, Liuzzi, Hülkenberg, Kovalainen, Barrichello, Trulli, Glock, Senna, Buemi, di Grassi and Chandhok. The top nine drivers remained in the same positions in which they had qualified, and as the race continued, there was a threat of rain forecast by meteorological service Météo-France which intensified by hot weather and heavy clouds brewing to the west of the circuit. Trulli pulled off to the side of the track with an hydraulic failure, becoming the first retirement on lap 35. Trulli's teammate Kovalainen retired the lap after with a power steering failure in turn eight which was followed by him not being able to operate his gearbox, clutch and throttle and his car was pushed into the Lotus garage. Lewis Hamilton (pictured in 2008) took his first victory of the year. On lap 39, Webber asked Red Bull to advise Vettel to reduce his speed but his request was rejected due to the quick pace and the close distance between themselves and the McLaren cars. Webber entered fuel-saving mode on lap 40 which lost him performance while Vettel had saved one kilogram of fuel and opted to run on a faster engine setting. Vettel got a run exiting turn eleven and took to the inside lane to draw alongside Webber on the back straight. As the pair approached turn twelve, they made contact at high-speed which sent Vettel spinning through 360 degrees twice. Both drivers ended on the run-off area and Vettel almost hit Webber again as Hamilton and Button overtook them and took the lead. Vettel retired with a punctured right-rear tyre. Webber sustained damage to his front wing endplate. The expected rain only manifested as a very light drizzle on lap 41, as Webber made a pit stop for a replacement front wing two laps later. Hamilton was informed by McLaren to conserve fuel on lap 44 as the drivers drove cautiously through turn one because of the light rain. Senna drove to the pit lane to retire with an fuel pressure issue. Button was instructed to conserve fuel although he was not given a target lap time because the team's chief engineer Phil Prew felt Button would not pass his teammate. Hamilton had been told by his race engineer Andy Latham that Button would not overtake him. Both drivers had been asked by McLaren to drive cautiously through turn eight where there was a high risk for problems with their front right tyres. Button drew alongside teammate Hamilton on lap 48 heading into turn twelve and passed Hamilton (who drove on the inside line) around the outside of the corner. Hamilton reclaimed the lead on the following lap after getting a run on the pit straight and narrowly avoided a collision with Button at turn one. Hamilton began to pull away from teammate Button. Sutil passed Kobayashi around the outside for tenth on lap 52 while Button was ordered to conserve his tyres and fuel on the same lap. Chandhok became the final retirement of the race when he drove into the pit lane with a fuel pump failure on lap 53. Alonso attempted to overtake Petrov around the outside of turn one on lap 54 but was unable to get ahead. Alonso tried again going into turn three and Petrov (who had worn tyres) made an error allowing Alonso to move into eighth. Both drivers made contact and Petrov sustained a punctured tyre. Petrov made a pit stop for soft tyres on lap 56 and emerged in 15th. Hamilton maintained his lead throughout the remainder of the race and took the checkered flag on lap 58 to secure his first win of the season, 2.6 seconds in front of teammate Button. Webber was third, ahead of Schumacher who equalled his best result of the season, having finished fourth at the Spanish Grand Prix as well. Rosberg held off Kubica to take fifth, followed by Massa, Alonso, Sutil and Kobayashi. De la Rosa was close behind teammate Kobayashi in eleventh. Alguersuari and Liuzzi took the next two positions. Barrichello, Petrov, Buemi, Hülkenberg, Glock, di Grassi and Chandhok (despite his mechanical issues) were the last of the classified finishers. Hamilton's victory made him the fifth different driver in seven races to win a Grand Prix in 2010. The top three drivers appeared on the podium to collect their trophies and in a later press conference. Hamilton said the race was "quite exciting" and dedicated the victory to his father Anthony. He stated that he was unfortunate up until the race but was happy that he could help McLaren achieve their second 1–2 finish of the season. Button said his second-place result was pleasing despite him starting from fourth position, and stated the pace of his McLaren was good. He felt the event was "fun", and praised his team for improving his car which allowed them to challenge Red Bull. Webber revealed that he had been confident that he would be able to take victory having fended off both McLaren cars for the previous 40 laps. He also stated the first stint of the race was "very interesting" and had expected it to be an "interesting race" but revealed he was not as comfortable on the hard-compound tyre. Much of the post-race debate centred on the Red Bulls' clash at the front of the field on lap 40. Both Webber and Vettel blamed each other for the crash. Team principal Christian Horner implied Webber remained partially responsible for failing to give Vettel enough room on the run to the corner, and he was noticeably frustrated and angry at both of his drivers for wasting a potential 1–2 finish. Red Bull motorsport adviser Helmut Marko insisted the team did not favour Vettel through their strategy and also offered the perspective that Vettel had to attack for fear of backing off into the clutches of Hamilton behind. McLaren chief engineer Tim Goss said the crash had prevented Red Bull from securing a 1–2 finish, but understood why Webber switched to a different engine mode as he noted that one of Vettel's engines had failed earlier in the season. He felt that the battle between both McLaren and Red Bull drivers for both championships would continue unabated. Red Bull held a meeting at their factory in Milton Keynes four days after the race, and all people in attendance believed the situation had been dealt with. The incident between Webber and Vettel is widely seen by the media as a key moment in the rivalry between the two drivers, which had started when Vettel collided with Webber at the 2007 Japanese Grand Prix and both drivers were forced to retire. Mercedes maintained they had achieved what the car was capable of with fourth and fifth-place finishes for Schumacher and Rosberg respectively. Massa said it was a "very boring" and "difficult" race from his point of view because he was behind Kubica for the duration of the race whom he could not overtake. Alonso was disappointed with the team's performance in what Ferrari identified as their 800th start, yet he looked forward to upgrades in the following races. James Key, the technical director of BMW Sauber, was happy with the double finish and the one point the team picked up, courtesy of Kobayashi. Despite setting the race's fastest lap, Petrov was disappointed to not finish in a points-scoring position. He said it was bad luck but stated there were many positives he could take from the event and hoped that he could achieve a stronger result in Canada. The result meant Webber extended his lead in the Drivers' Championship to five points over Button who moved into second place. Hamilton's victory meant he moved into third, while Alonso's eighth-place finish resulted in moving from fifth to fourth. Vettel's retirement resulted in him falling from second to fifth. McLaren's 1–2 result allowed them to move into the lead of the Constructors' Championship with a one-point advantage over Red Bull. Ferrari's poor finish meant they fell from second to third, while Mercedes remained in fourth position with 100 points. Renault retained fifth on 73 points, with 12 races left in the season. After their strong finish, Hamilton hoped McLaren's result would give them further momentum to challenge Red Bull for the championship. ^1 — Lucas di Grassi started from the pit lane after an issue with his engine's oil system was discovered. ^ a b c "2010 Formula 1 Turkish Grand Prix – Race Results". formula1.com. Archived from the original on 29 October 2014. Retrieved 28 December 2015. ^ Panzariu, Ovidiu (11 December 2009). "FIA Confirms New Point System for F1, 2010 Calendar". Auto Evolution. Archived from the original on 15 December 2009. Retrieved 18 June 2016. ^ "Bridgestone announces tyre compounds". motorsport.com. 25 March 2010. Archived from the original on 14 June 2015. Retrieved 3 June 2015. ^ a b c d e f "2010 Championship Classification". Fédération Internationale de l'Automobile. Archived from the original on 15 December 2010. Retrieved 26 May 2015. ^ "Title not just between Red Bull drivers, says Webber". GPUpdate. JHED Media BV. 18 May 2010. Archived from the original on 16 June 2015. Retrieved 4 June 2015. ^ a b c Cary, Tom (28 May 2010). "F1 Turkish Grand Prix: Fernando Alonso confident Ferrari are moving up a gear". The Daily Telegraph. Archived from the original on 15 June 2015. Retrieved 4 June 2015. ^ a b Daily News with wires (26 May 2010). "Drivers looking forward to Turkish Grand Prix". Hürriyet Daily News. Doğan Media Group. Archived from the original on 14 June 2015. Retrieved 4 June 2015. ^ Noble, Jonathan (20 May 2010). "Vettel to get new chassis for Turkey". Autosport. Haymarket Publications. Archived from the original on 14 June 2015. Retrieved 3 June 2015. ^ "Red Bull RB6 – F-duct system". Formula1.com. 30 May 2010. Archived from the original on 1 June 2010. Retrieved 3 June 2015. ^ "Ferrari F10 – revised F-duct control (a)". Formula1.com. 29 May 2010. Archived from the original on 1 June 2010. Retrieved 3 June 2015. ^ "Williams to revert to old front wing". ESPN. 24 May 2010. Archived from the original on 27 May 2010. Retrieved 3 June 2015. ^ "Lotus Racing to use new rear wing in Turkish Grand Prix". BBC Sport. 28 May 2010. Archived from the original on 31 May 2010. Retrieved 3 June 2015. ^ "Di Grassi receives larger fuel tank". GPUpdate. JHED Media BV. 27 May 2010. Archived from the original on 16 June 2015. Retrieved 3 June 2015. ^ a b "2010 Formula One Sporting Regulations" (PDF). Fédération Internationale de l'Automobile. 11 February 2010. Archived from the original (PDF) on 30 March 2010. Retrieved 26 May 2015. ^ a b "Jenson Button fastest for McLaren in Turkey GP practice". BBC Sport. 28 May 2010. Archived from the original on 29 May 2010. Retrieved 4 June 2015. ^ a b Beer, Matt (28 May 2010). "Hamilton tops first Turkey practice". Autosport. Haymarket Publications. Archived from the original on 14 June 2015. Retrieved 4 June 2015. ^ "Driver error caused Sutil shunt". GPUpdate. JHED Media BV. 28 May 2010. Archived from the original on 16 June 2015. Retrieved 4 June 2015. ^ "Practice Two – Button on top in Turkey". Formula1.com. 28 May 2010. Archived from the original on 31 May 2010. Retrieved 4 June 2015. ^ Beer, Matt (29 May 2010). "Vettel goes quickest in final practice". Autosport. Haymarket Publications. Archived from the original on 14 June 2015. Retrieved 4 June 2015. ^ Creighton, Geoff; Hughes, Emlyn (29 May 2010). "As it happened: Qualifying". Autosport. Haymarket Publications. Archived from the original on 14 June 2015. Retrieved 5 June 2015. ^ a b c "Turkish GP – Saturday – Qualifying Session Report". GrandPrix.com. Inside F1, Inc. 29 May 2010. Archived from the original on 15 June 2015. Retrieved 5 June 2015. ^ a b Hughes, Ian (30 May 2010). "Red Bull's Mark Webber claims pole for Turkish GP". BBC Sport. Archived from the original on 3 June 2010. Retrieved 5 June 2015. ^ a b c d "Qualifying – selected team and driver quotes". Formula1.com. 29 May 2010. Archived from the original on 31 May 2010. Retrieved 5 June 2015. ^ a b c d "Istanbul Park results; Qualifying: Saturday, 29 May 2010". BBC Sport. 29 May 2010. Archived from the original on 16 May 2014. Retrieved 30 May 2010. ^ a b c d e f g h i j k l m n o Creighton, Geoff; Hughes, Emlyn (30 May 2010). "As it happened: Race day at Istanbul Park". Autosport. Haymarket Publications. Archived from the original on 5 January 2016. Retrieved 7 October 2015. ^ a b c d e f g h "Turkish GP – Sunday – Team Quotes". GrandPrix.com. Inside F1, Inc. 30 May 2010. Archived from the original on 4 October 2015. Retrieved 7 October 2015. ^ a b "FIA post-race press conference – Turkey". Formula1.com. 30 May 2010. Archived from the original on 2 June 2010. Retrieved 18 July 2016. ^ a b c d e f Orlovac, Mark (30 May 2010). "Turkish GP as it happened". BBC Sport. Archived from the original on 31 May 2010. Retrieved 7 October 2015. ^ a b c d "Turkish GP – Sunday – Race Notes". GrandPrix.com. Inside F1, Inc. 30 May 2010. Archived from the original on 4 October 2015. Retrieved 7 October 2015. ^ a b c "Lap Chart". Fédération Internationale de l'Automobile. 30 May 2010. Archived from the original on 5 January 2016. Retrieved 7 October 2015. ^ a b Noble, Jonathan (7 June 2010). "No Button/Hamilton orders in Turkey". Autosport. Archived from the original on 7 August 2016. Retrieved 18 July 2016. ^ Rafferty, Peter (2 June 2010). "Webber 'asked Vettel to back off'". The Independent. Archived from the original on 20 August 2016. Retrieved 18 July 2016. ^ a b c "Mark Webber & Sebastian Vettel play crash blame game". BBC Sport. 30 May 2010. Archived from the original on 10 June 2010. Retrieved 11 October 2015. ^ Cary, Tom (8 June 2010). "McLaren duo's controversial Turkey GP battle occurred due to 'wrong opinion' on radio". The Daily Telegraph. Archived from the original on 21 September 2016. Retrieved 18 July 2016. ^ "McLaren told Hamilton that Button wouldn't pass". motorsport.com. 6 June 2010. Archived from the original on 14 September 2016. Retrieved 18 July 2016. ^ McKean, Tom (2 June 2010). "Skid over for Turkish GP winner Hamilton". ESPN. Archived from the original on 19 August 2016. Retrieved 18 July 2016. ^ Logothetis, Paul (30 May 2010). "Hamilton leads Button in McLaren 1–2 at Turkish GP". The San Diego Union-Tribune. Associated Press. Archived from the original on 17 August 2016. Retrieved 18 July 2016. ^ "Red Bull collision 'not ideal' says Mark Webber". The Daily Telegraph. 30 May 2010. Archived from the original on 2 June 2010. Retrieved 5 June 2010. ^ Noble, Jonathan (30 May 2010). "Red Bull denies favouring Vettel". Autosport. Haymarket Publications. Archived from the original on 6 August 2016. Retrieved 19 July 2016. ^ "Red Bull 'threw away easy one–two' in Turkey, says McLaren's Tim Goss". The Guardian. Press Association. 31 May 2010. Archived from the original on 3 June 2010. Retrieved 5 June 2010. ^ "RBR drivers make up after Turkish GP crash". crash.net. 4 June 2010. Archived from the original on 16 August 2016. Retrieved 18 July 2016. ^ Dale, William (25 March 2013). "A history of drama and tension fuels Mark Webber and Sebastian Vettel's on-track rivalry". Fox Sports Australia. Archived from the original on 27 June 2016. Retrieved 18 July 2016. ^ van Leeuwen, Andrew (28 July 2015). "Webber: Vettel is not an enemy". motorsport.com. Archived from the original on 11 August 2016. Retrieved 11 August 2016. ^ "Front-row seat for Lewis". Sky Sports. 30 May 2010. Archived from the original on 15 August 2016. Retrieved 19 July 2016. 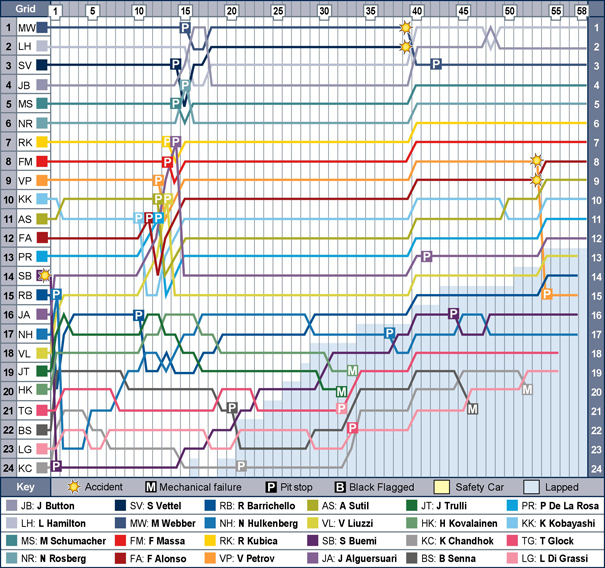 ^ a b "Turkey 2010 - Championship • STATS F1". www.statsf1.com. Retrieved 21 March 2019.